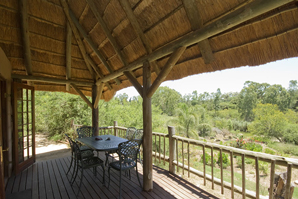 Each riverside chalet has sleeping place for two to five people. It has two single beds on the ground floor and 3 beds up on a mezzanine level in the rafters of the thatch roof accessible by staircase. 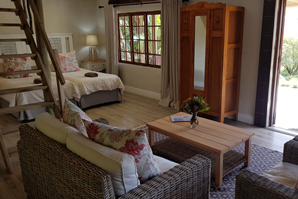 A kitchenette, private braai (Barbeque) facility and own shower and toilet are included. Bedding and towels are provided. The chalet is open plan. 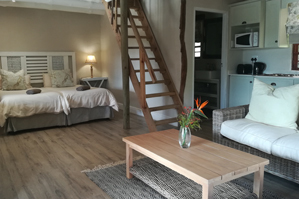 The unit cost is R1000 per night (excluding breakfast). The 6-sleeper riverside chalet has 2 bedrooms on the ground floor. It has a mezzanine floor in the rafters which is accessible by ladder. There are two beds on the mezzanine. Each bedroom has 2 x single beds. The chalet has a private shower / toilet. Bedding and towels are provided. A kitchenette and private barbeque area (braai) provided. The rate on the accommodation is R1000 per night for the chalet (excluding breakfast). Please note all rates include VAT and are subject to change without notice. Full payment of accommodation account due 30 days prior to client’s arrival. Bookings confirmed of 3 or more rooms 50% deposit required within 7 days of confirmation and the Balance payable 30 days prior to guests’ arrival.